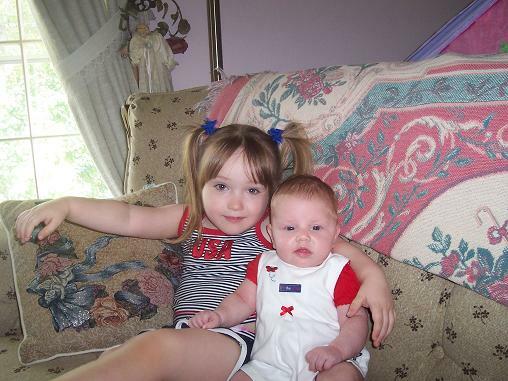 We had a wonderful 4th of July! We were able to spend the weekend with some family from out of town and it was so much fun. We were able to see my Aunt Gladys and Uncle Dave as well as my cousin Vicki and her three kids- Lucas, Caleb and Danielle. Hailey was thrilled to meet Danielle. She wanted to hold her constantly. 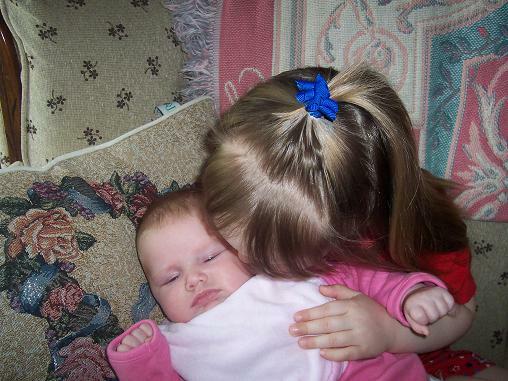 And of course, Hailey had lots of kisses for Danielle. Hailey read Danielle some books- and Danielle seemed to enjoy the stories! Lucas and Caleb let Hailey play the Wii with them- or at least let her think she was playing. 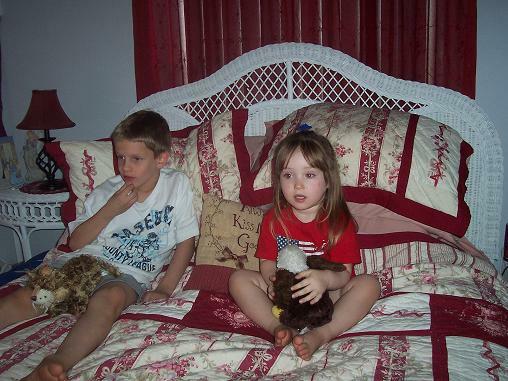 Caleb and Hailey enjoyed watching some movies together. Hailey and Danielle posed in their 4th of July outfits. 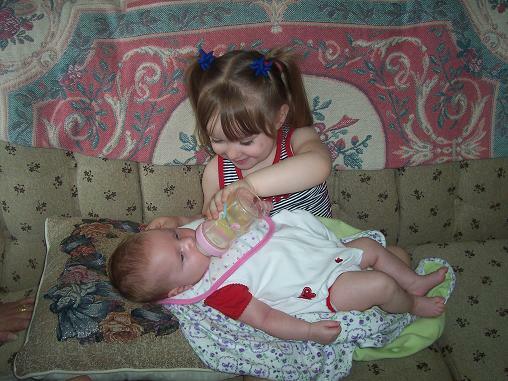 Hailey was excited to be able to feed Danielle! 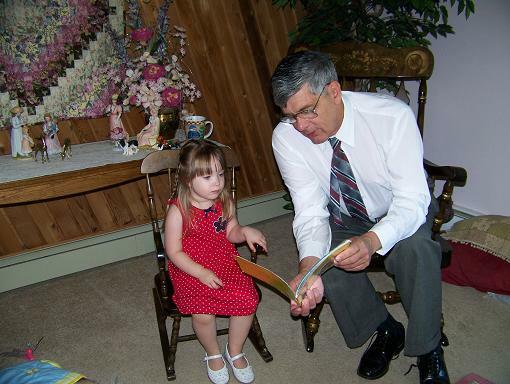 Hailey and Uncle Dave were the first ones ready for church on Sunday, so they read some books while they waited for the rest of us. 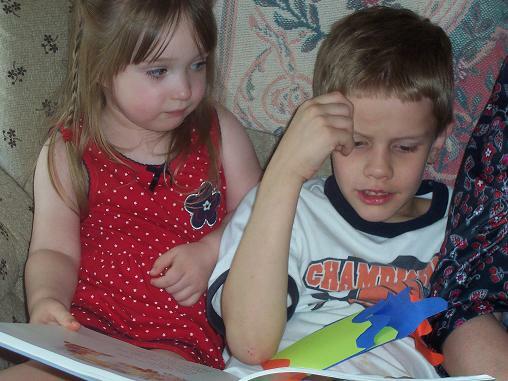 After church Hailey loved listening to Caleb read her a book. 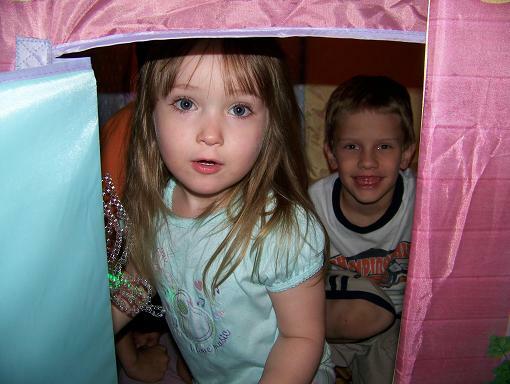 Later on Hailey, Lucas and Caleb were all in Hailey’s play house. On Monday the kids were able to do a little swimming. The water is still pretty cold but they had fun anyways. 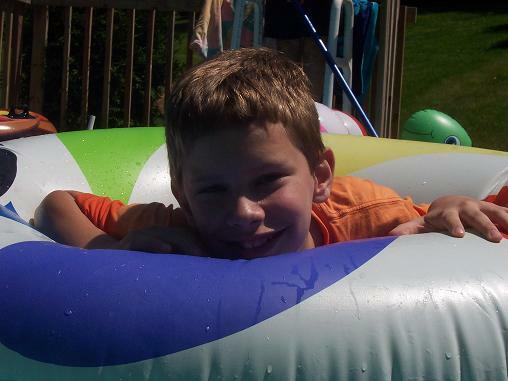 Lucas enjoyed floating in the pool. 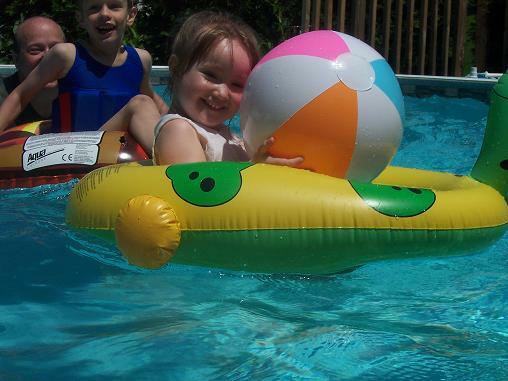 Hailey tried to make sure she held onto this ball the entire time she was in the pool. 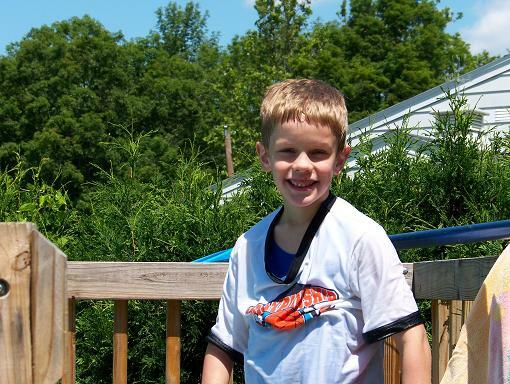 Caleb posed for a quick picture. 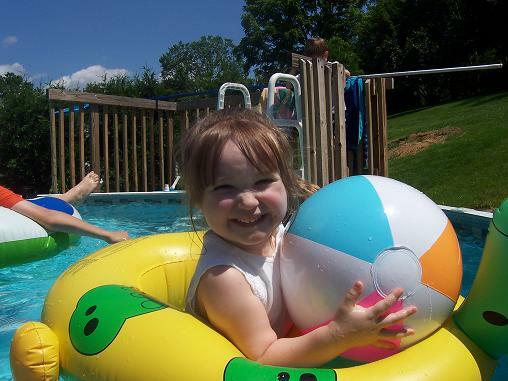 Hailey loved being in the pool. Since we’re still in the middle of moving all of our stuff is in my parents garage. We couldn’t get to Hailey’s bathing suit or her swim diapers- so she had to wear clothes and a pull-up. Do you know what happens when a pull-up gets wet? I was afraid it might fall apart, but actually it just swells up to a huge size. 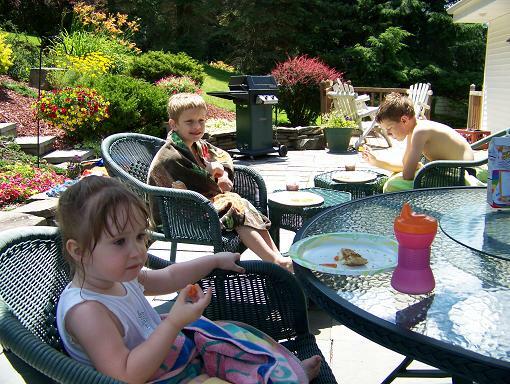 The kids enjoyed lunch on the patio and then we had to say good-bye. It was lots of fun to get to see our family that we don’t get to see nearly enough. We had a blast! Glad you had such a good time! Hailey is getting so grown up! That was great! Glad ya’ll had such a great time. And I will say it again because I know I’ve said it before….Hailey has such amazing eyes! 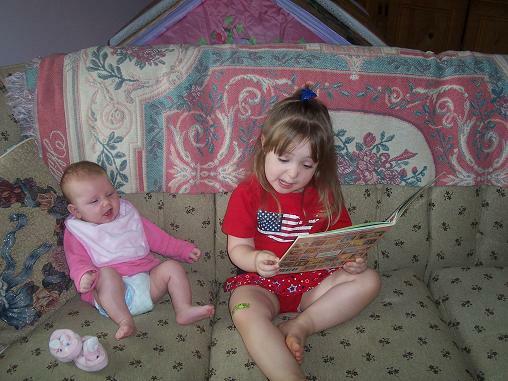 Loved the picture of her reading to the little one. And one day she will love the picture of the pull up. LOVE the one of Hailey reading to Danielle. 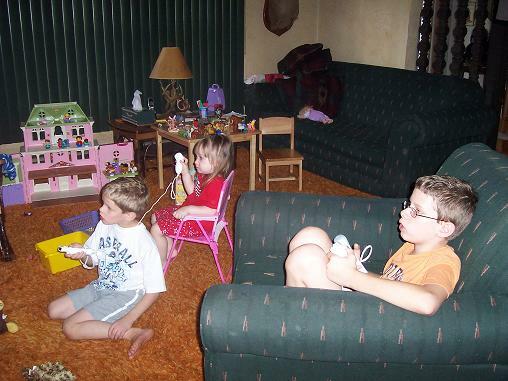 The expressions on their faces are priceless. Haily seems so comfortable with the baby. 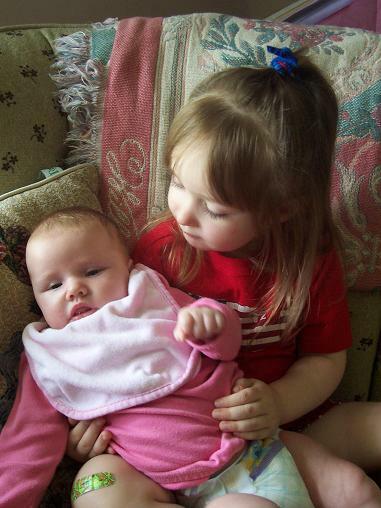 Methinks she’d like being a big sister. Plans? Looks like a fun time. I always enjoy spending time with my family. I just love all the pictures, especially the pictures of Hailey holding that cute little baby. So sweet!! Thanks for stopping by Melanie. Looks wonderful and looks like Hailey would be such a good big sister. I love all of the pictures!